How to watch Danger Mouse: Classic Collection: Season 10 (1984) on Netflix Canada! Yes, Danger Mouse: Classic Collection: Season 10 is now available on Canadian Netflix. It arrived for online streaming on October 3, 2017. We'll keep checking Netflix Canada for Danger Mouse: Classic Collection: Season 10, and this page will be updated with any changes. Follow the adventures of superspy Danger Mouse and his bumbling sidekick, Penfold, as they jet around the world foiling their enemies' evil plots. He's an eyepatch-wearing super-spy with a talent for saving the world. He's also, technically, a rodent. 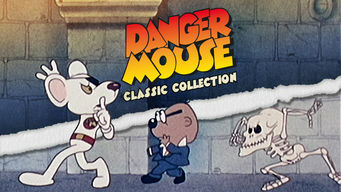 Season 1 of Danger Mouse: Classic Collection has 11 episodes. Because different Netflix countries have different availability for episodes, you'll need to check the episode listing below to see which are available in Canada. Danger Mouse must fend off ever-larger robots of destruction unleashed by his evil archrival Baron Greenback. Danger Mouse must survive a mechanical Loch Ness Monster attack to stop Baron Greenback from taking over the world with stolen bagpipes. Baron Greenback kidnaps Colonel K and forces him to send Danger Mouse and Penfold on vacation to a castle full of robot ghosts and mummies. When Baron Greenback unleashes giant super-chickens on London, Danger Mouse and Penfold enlist the help of Flying Officer Buggles Pigeon. With plans of tunneling into the Bank of England, Baron Greenback creates a Martian mouse exterminator to take care of Danger Mouse. Baron Greenback traps Danger Mouse and Penfold in his Dream Machine, where anything Penfold says comes to life. Penfold thinks he is lord of the jungle when he and Danger Mouse travel to Africa to save 20,000 elephants Baron Greenback turned into sugar cubes. Danger Mouse must save the prime minister from Baron Greenback, who is causing the leaders of the world to laugh themselves to death. Baron Greenback uses his newly perfected intergalactic traveling device to blast Danger Mouse and Penfold to a planet ruled by talking machines. Danger Mouse travels to the North Pole, where Baron Greenback is using an antigravity machine to prevent Earth from rotating. Danger Mouse and Penfold must stop Baron Greenback's latest diabolical plot to sink England with a plague of heavy pyramids. Season 2 of Danger Mouse: Classic Collection has 6 episodes. Because different Netflix countries have different availability for episodes, you'll need to check the episode listing below to see which are available in Canada. When Baron Greenback's latest evil deed leaves the world drowning in custard, Danger Mouse must track down the Custard Mite of Glut. Danger Mouse and Penfold head to an island near the Bermuda Triangle to stop Baron Greenback, but they're abducted by aliens and subjected to a probe. Baron Greenback challenges Danger Mouse to a high-stakes duel, with the loser promising to bow out of the world of crime for good. Baron Greenback has gained control of London's washing machines and is ordering them to destroy Danger Mouse, who fights back using a giant magnet. When Baron Greenback creates a bad luck ray from a laser and a stolen jewel, Danger Mouse and Penfold must return the gem to its rightful owner. Baron Greenback kidnaps Penfold and demands that Danger Mouse round up four ingredients for a spell that would summon a powerful monster. Season 3 of Danger Mouse: Classic Collection has 5 episodes. Because different Netflix countries have different availability for episodes, you'll need to check the episode listing below to see which are available in Canada. Using a ray to shrink himself, Baron Greenback invades Colonel K's body, with a newly shrunken Danger Mouse and Penfold in pursuit. When top secret cargo ships begin disappearing in the vicinity of a mysterious ghost bus, Danger Mouse rushes to the Indian Ocean to investigate. Danger Mouse and Penfold head to America when they learn that Baron Greenback has devised an ingenious method for stealing the world's great monuments. Danger Mouse Saves the World... Again! Threatening to destroy every signpost in the world, Baron Greenback lures Danger Mouse and Penfold to his secret lair somewhere in the Pacific Ocean. Baron Greenback pulls out all the stops to thwart Danger Mouse as he transports secret plans hidden in a football from Australia to London. Season 5 of Danger Mouse: Classic Collection has 10 episodes. Because different Netflix countries have different availability for episodes, you'll need to check the episode listing below to see which are available in Canada. Danger Mouse and Penfold head deep into the jungle to find the lost crown of an Aztec ruler -- but Baron Greenback has a trick or two up his sleeve. 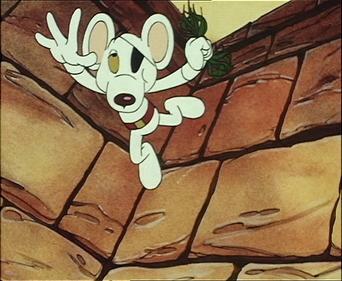 Sent with Danger Mouse to battle a small but ferocious dragon, Penfold gets himself captured by the beast and imprisoned in his castle. Baron Greenback's dastardly new invention, a cloning machine, confounds Danger Mouse by creating hundreds of duplicate Penfolds. Danger Mouse and Penfold blast off for the moon to sabotage a communications-jamming base Baron Greenback has constructed there. Using his new weather-controlling machine, Baron Greenback pelts Danger Mouse and Penfold with hail and plans to unleash a new ice age upon the earth. Danger Mouse and Penfold get a frightful awakening when Colonel K chooses them as ambassadors to greet aliens who are about to land in Scotland. While henchman Stiletto creates a diversion, Baron Greenback uses a new device to remotely take control of Danger Mouse and Penfold's flying car. A peddler of gadgets tries to interest Danger Mouse and Penfold in devices to help them infiltrate Baron Greenback's new secluded lair. Blasted by Baron Greenback's age-altering bombs, Danger Mouse turns into a boy rodent and Penfold transforms into a geriatric hamster. Nero uses the extraordinary mental powers he accidentally gained from one of Baron Greenback's inventions to torment Danger Mouse and Penfold. Season 4 of Danger Mouse: Classic Collection has 9 episodes. Because different Netflix countries have different availability for episodes, you'll need to check the episode listing below to see which are available in Canada. The Wild, Wild Goose Chase! 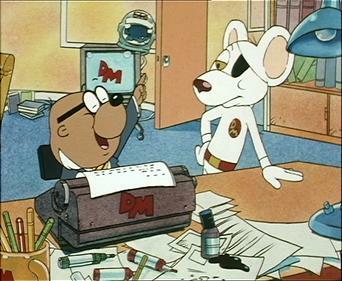 Danger Mouse and Penfold travel the world visiting Baron Greenback's hideouts after coming across his computerized hideout locator. The Return of Count Duckula! Count Duckula pays a visit to London, where he captures Danger Mouse and Penfold while trying to break into showbiz. Danger Mouse prepares to face off against a demon from the fourth dimension who's been stealing the world's most famous buildings. Danger Mouse must come to the rescue when Prof. Von Squawkencluck accidentally sends Penfold back to the prehistoric era in his time machine. When the Mark 5 passes through an electrical storm, Danger Mouse and Penfold are transported to a future era where Britain is ruled by cats. 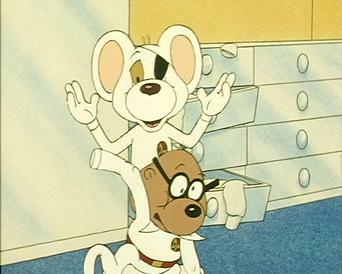 Colonel K's team creates robot versions of Danger Mouse and Penfold so one pair can meet with Agent 57 while the other deals with Baron Greenback. After visiting the Rock of Gibraltar, Danger Mouse and Penfold track Baron Greenback to a skyscraper in New York City. Baron Greenback joins forces with Count Duckula to search for the Great Bone Idol, which would enable them to control all the dogs in the world. When Danger Mouse loses his memory, Baron Greenback tricks the secret agent into believing he's actually a criminal mastermind. Season 6 of Danger Mouse: Classic Collection has 27 episodes. Because different Netflix countries have different availability for episodes, you'll need to check the episode listing below to see which are available in Canada. Danger Mouse and Penfold inadvertently get sent back in time to the year 1215, where they get caught up in a strange Robin Hood scenario. All of the most important seats in England are stuffed with cactus needles, so Danger Mouse and Penfold head to Mexico to track down Greenback. Danger Mouse and Penfold have to rely on a cassette player when the world's worst composer decides to destroy all music other than his. Greenback uses a device to brainwash Colonel K into sending DM and Penfold to the South Pole, but Penfold's bad hearing makes him immune to it. A spaceship crash-lands in Birmingham, and the alien inside is looking for his pet, a furry creature that multiplies every time something touches it. Penfold has a cold, so Agent 57 joins Danger Mouse in a plot to defeat Greenback. But 57 gets a cold too, and changes form every time he sneezes. An experimental enzyme being developed by the Wonder White Sub company gets loose and starts attacking people and turning everything white. While Danger Mouse and Penfold are investigating a robbery of the crown jewels, they end up in a grandfather clock that's actually a time machine. Danger Mouse's flying car, the Mark III, begins to rebel against him and it's keeping him and Penfold from attending an awards ceremony. An alien named J.J. Quark arrives and attempts to take control of Earth, believing that he's entitled to it because of an old charter. Greenback hopes to cash in by melting the polar ice caps so he can sell inflatable rafts and toys at a ridiculously high price. While Greenback is away on vacation in France, Stiletto uses a ray to make spiders get bigger and build webs that envelop all of London. Danger Mouse must work with an organization called BLEEP to locate an estate that's been stolen by a villainous warthog named Hannibal. J.J. Quark proposes peace talks with Danger Mouse in Africa but sends a beast called a Fangboner after Danger Mouse and Penfold when they arrive. 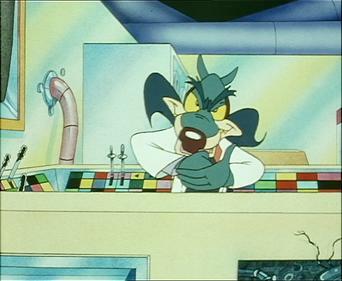 The villainous El Loco poisons Danger Mouse's milk, forcing Penfold into action to stop El Loco. When a mechanical cat kidnaps Colonel K, Danger Mouse and Penfold try to save him. But the cat seems to be able to stay one step ahead of them. Danger Mouse and Penfold travel to Stonehenge to investigate a disturbance, and Danger Mouse ends up having to battle his own evil side. Greenback causes trouble in London by using a ray to animate all of the city's statues, resulting in chaos and mayhem. The grandfather clock time machine returns with a wizard named Master Snozzle on board, and he's looking to take over the world. Greenback has sent Great Britain into a panic by stealing all of the world's tea and replacing it with dirty dishwater. 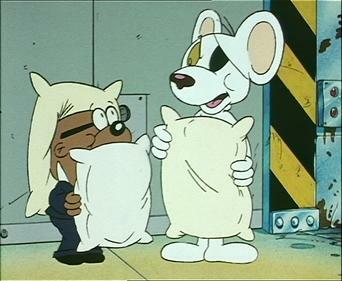 Danger Mouse and Penfold inadvertently bring back a bandit named El Loco when they return from a trip to Mexico. J.J. Quark gives Penfold a membership to an intergalactic book club, then brings the monsters in one book to life to torment him and Danger Mouse. Greenback wants to acquire an ancient Egyptian amulet, but instead of looking for it, he plans to steal it once Danger Mouse finds it. Danger Mouse and Penfold get caught up with a witch doctor when they go on a mission to an island near China to rescue Professor Squawkencluck. Penfold takes a pill invented by Professor Squawkencluck and turns into a superhero, causing issues for Danger Mouse as he searches for a pigeon. 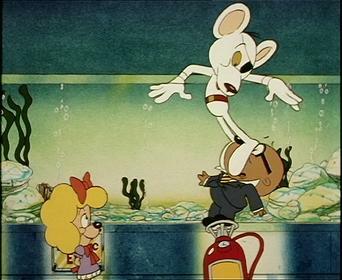 All of the world's machines turn against their owners and refuse to do their jobs, so Danger Mouse has to take action with his anti-mutiny module. Journey to the Earth's 'Cor! Tasked with finding the source of an awful noise that's bothering the world, Danger Mouse and Penfold end up at the North Pole. Season 7 of Danger Mouse: Classic Collection has 6 episodes. Because different Netflix countries have different availability for episodes, you'll need to check the episode listing below to see which are available in Canada. Danger Mouse and Penfold board the famous Orient Express when they learn of Baron Greenback's plans for a museum dedicated to Barry Manilow. When an alien invasion looms, Baron Greenback offers to team up with Danger Mouse and Penfold, but his truce could actually be a trap. When Dr. Frankenstoat invents a dastardly device that churns out robot vampoids, Danger Mouse and Penfold storm his castle. Danger Mouse and Penfold search for Merlin's wish-granting inkwell, but they've got competition from the villainous Copper-Conk Cassidy. Scottish snake Mac the Fork and wannabe scientist Dudley Poyson join forces to steal blueprints for a deadly weapon that could destroy Earth. Danger Mouse and Penfold blast off into space to investigate why the moon's gravitational pull is causing massive flooding on Earth. Season 8 of Danger Mouse: Classic Collection has 2 episodes. Because different Netflix countries have different availability for episodes, you'll need to check the episode listing below to see which are available in Canada. 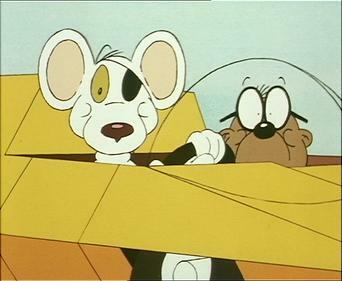 After London is shrouded in darkness for nearly a week, Danger Mouse and Penfold rocket into outer space to investigate the cause. When Baron Greenback uses his mind control machine and a passport photo to turn Penfold into an assassin, Danger Mouse is first on his hit list. Season 9 of Danger Mouse: Classic Collection has 6 episodes. Because different Netflix countries have different availability for episodes, you'll need to check the episode listing below to see which are available in Canada. When Baron Greenback schemes to melt the polar ice caps with sun lamps, Danger Mouse and Penfold head to the Arctic to foil his plan. Learning that a hairy beast is roaming the countryside and flattening villages with his feet, Danger Mouse and Penfold go to Canada to investigate. When the Statue of Liberty vanishes, Danger Mouse and Penfold leap into action to find out how Baron Greenback pulled it off. Dr. Crumhorn replaces Penfold with a mechanical double. Not to be outdone, Baron Greenback forces Stiletto to impersonate Penfold, too. When their Mark III flying car runs out of fuel, Danger Mouse and Penfold find themselves stranded in the Sahara Desert. In Spain, Don Coyote takes "Sancho" Penfold as his sidekick. Together, they attack a windmill that houses Baron Greenback's nefarious new device. Season 10 of Danger Mouse: Classic Collection has 7 episodes. Because different Netflix countries have different availability for episodes, you'll need to check the episode listing below to see which are available in Canada. While Danger Mouse and Penfold are in New York, Doctor Augustus P. Crumhorn III poses as a young girl and claims her father was kidnapped. Danger Mouse and Penfold are off to the Amazon Jungle where a mysterious tribe have been sacrificing people to an ant god. To investigate why all the European countries have swapped places, Danger Mouse and Penfold head to Bratislowakia and find something even worse. While Penfold is writing his memoir of his life with Danger Mouse, Dr. Crumhorn "Kazonks" them into a hallucinatory world. Danger Mouse must stop Baron Greenback's attempt to take over London with his army of remote-controlled, allergy-causing pillows. Dr. Crumhorn has overtaken London with concrete-swimming land sharks, and things get really dicey when Penfold becomes shark bait. A giant spaceship, which is part of the "Intergalactic 147" snooker game, is headed straight for Earth in order to sink it into a black hole.